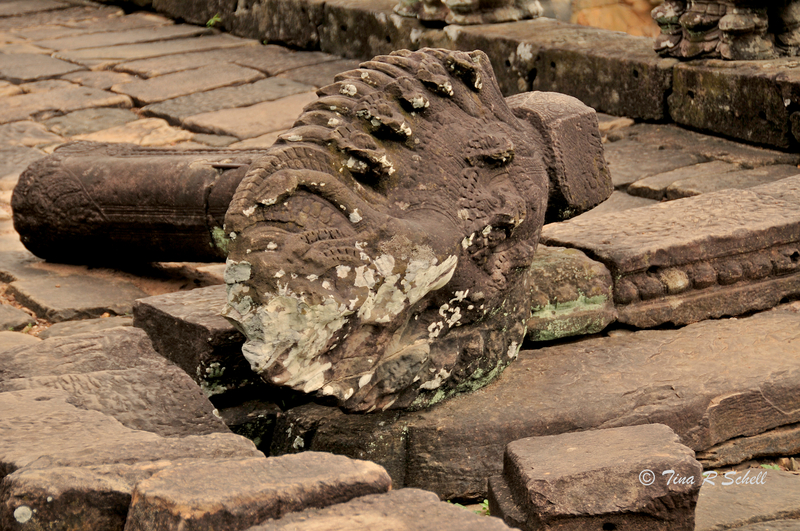 In a recent post I included two shots from Angkor Wat (click here). Based on the happy coincidence that this week’s challenge is “Masterpiece”, I thought I’d share some additional captures from that amazing place. 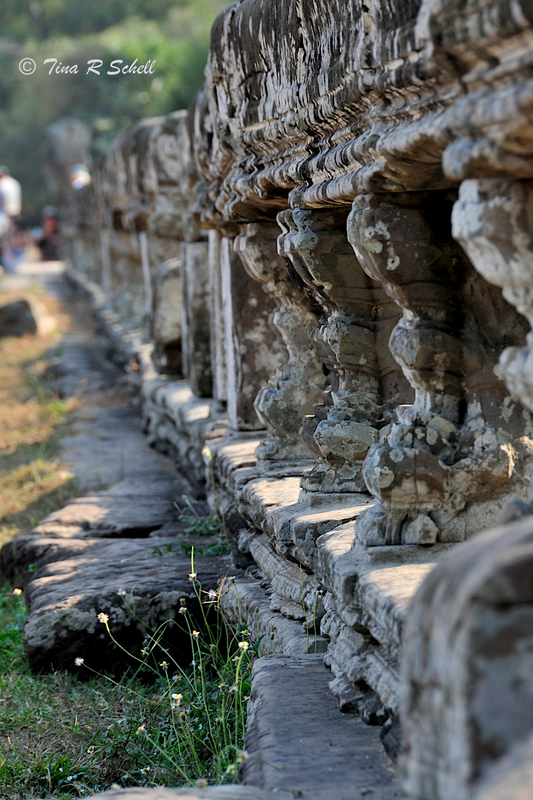 Angkor was the culmination of our journey throughout Southeast Asia which included Vietnam, Thailand, Laos and Cambodia. As a photographer the trip was a feast for my eyes and heart as well as my lens. 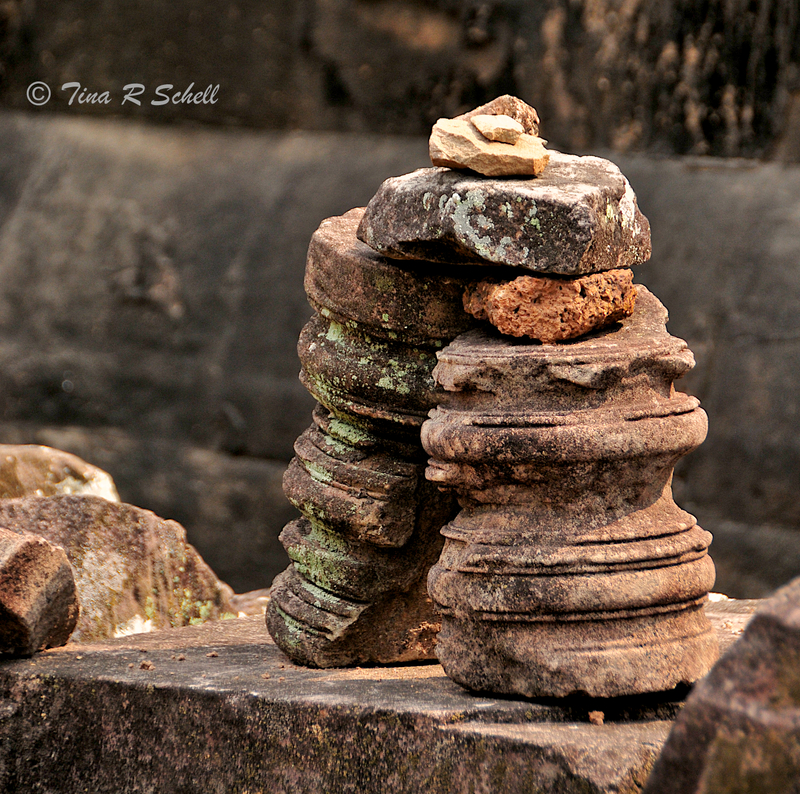 The temples of Angkor were definitely the highlight for me. 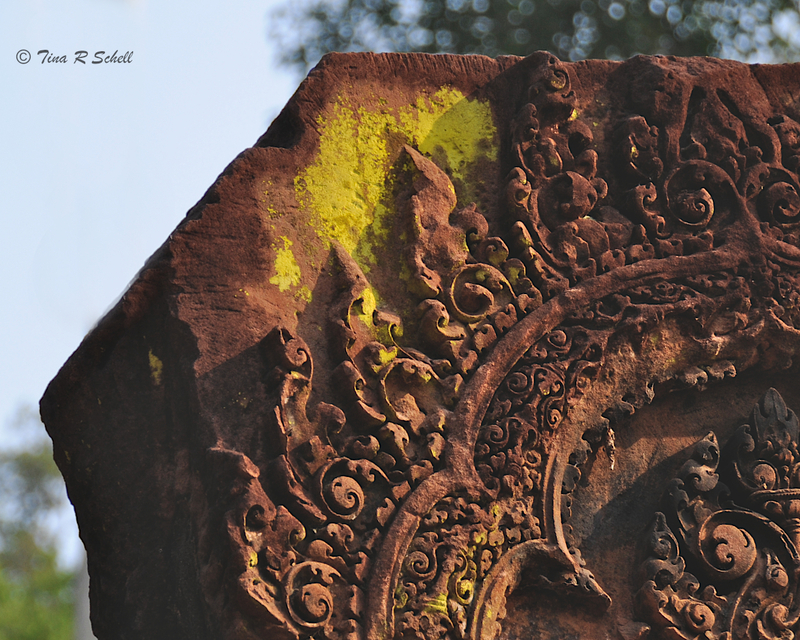 One of the largest archaeological sites in the world, Angkor was the center of the Khmer Kingdom from the 9th to the 14th century. It is made up of dozens of temples, or wats, as well as an intricate system of waterways – the work of an exceptional ancient civilization. 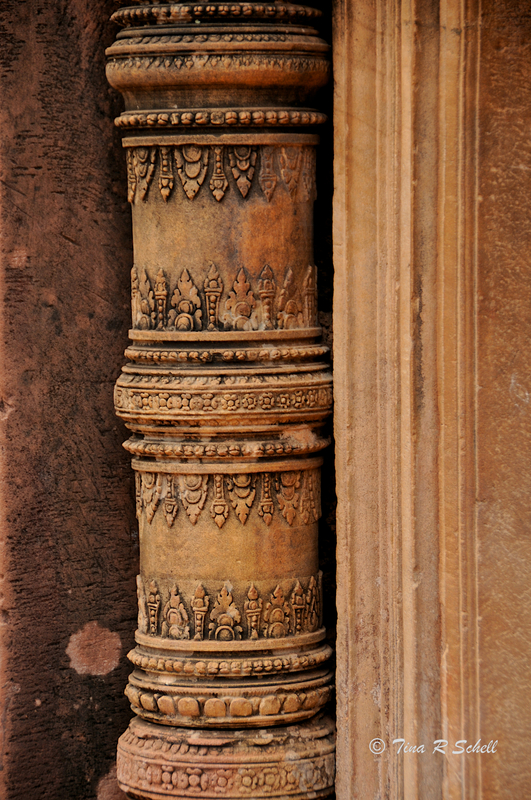 In this post I’ll focus on the architectural detail of the temples; to see the main temple as a whole, go to my previous post here. 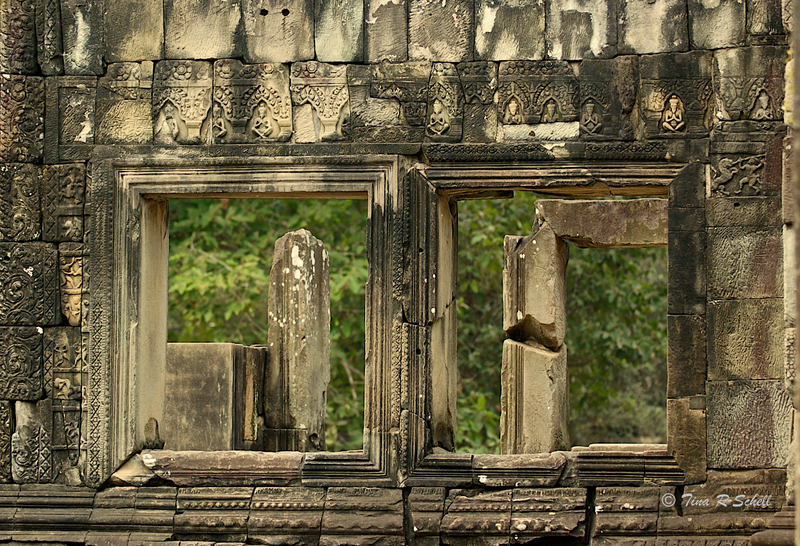 The temples are in various states of reconstruction. 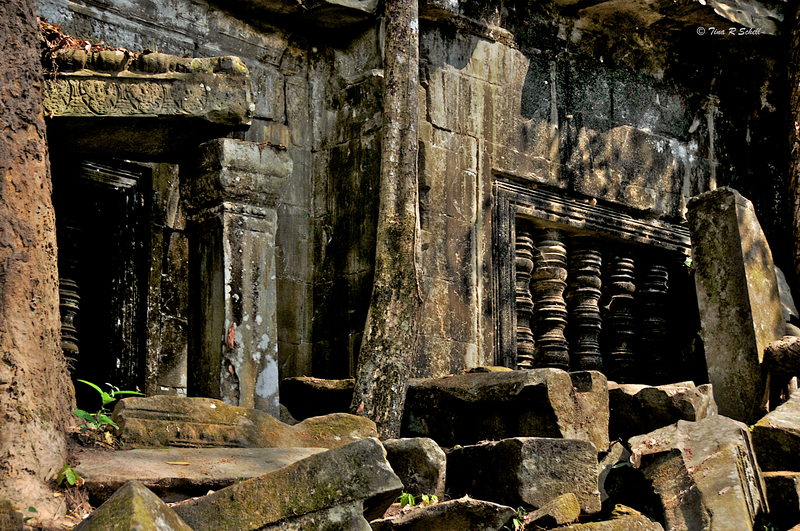 Ta Prohm, featured in this post’s first photograph, is the least updated and was actually my favorite. 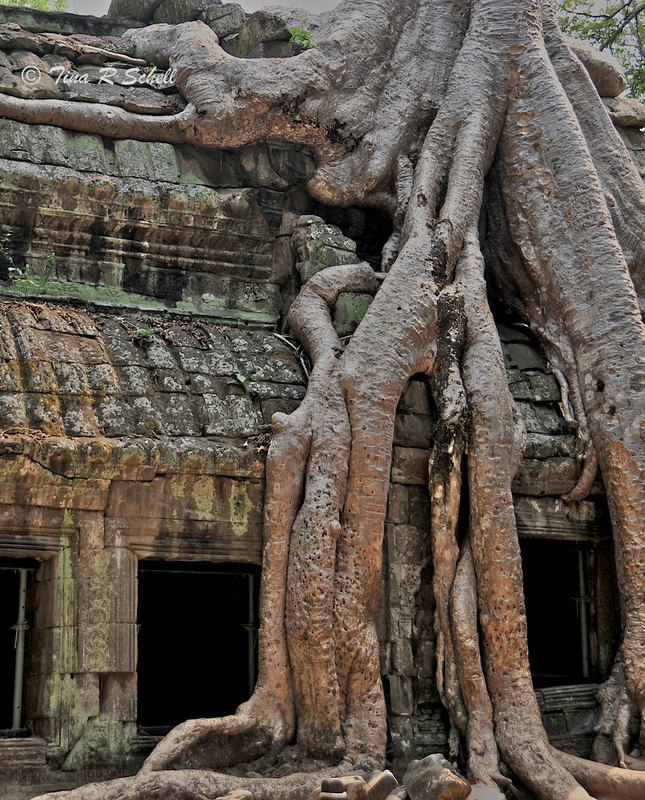 There you can see how incredibly nature has integrated with the structures – growing over, through and around the various buildings. 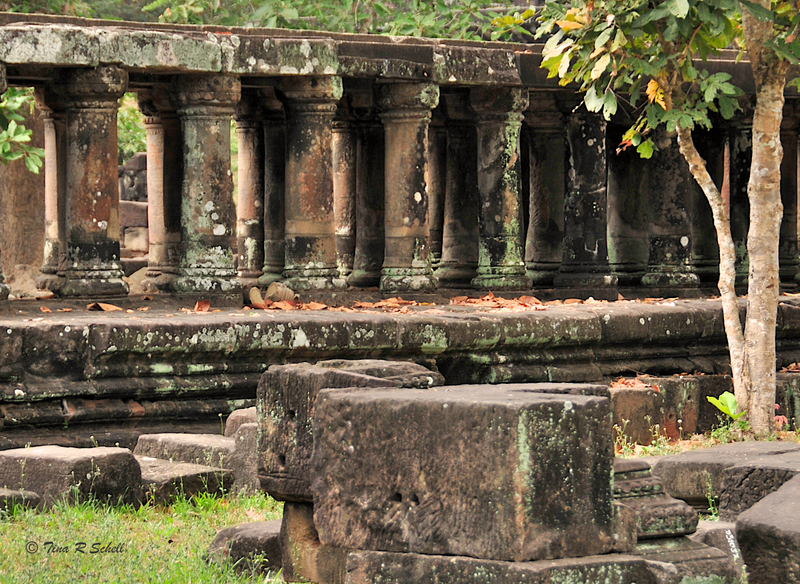 It also lends perspective to the massive amount of work that went into preservation, including that of some of the most famous, Angkor Wat, Angkor Thom and Bayon. 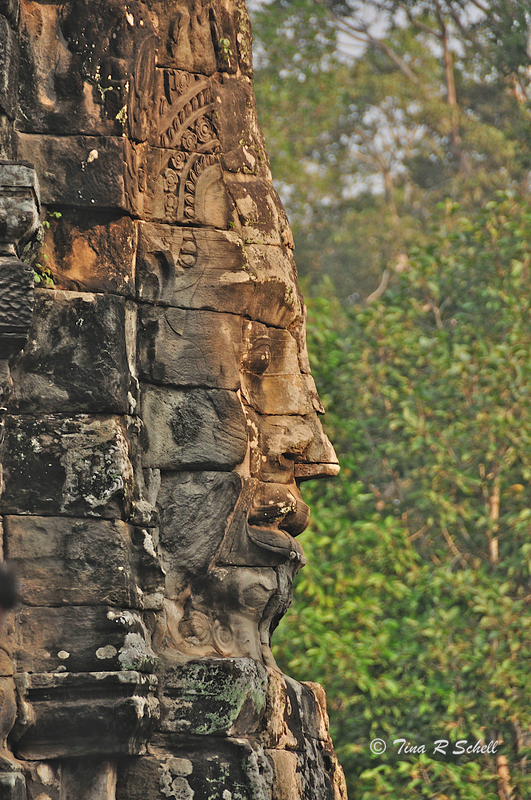 Although Angkor was never actually “lost” and hence wasn’t quite “found”, explorer Henri Mouhot is credited with bringing it to the attention of westerners in the early 19th century. Engineers have suggested that to build the temples today would require about 300 years, although centuries ago it was built in under 40. (Perhaps building permits and architectural fees were different in those days!) It is estimated that 5 million tons of sandstone were used to build the structures, all of which had to be transported by river from over 25 miles away. 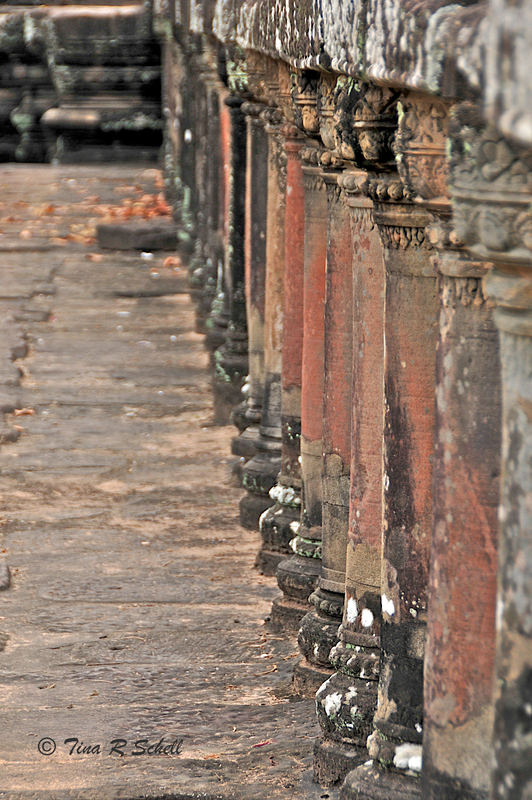 The temples, although teeming with tourists, maintain an air of quiet dignity and spirituality. Because they are so large, it is possible to find solitude and peace around many of their corners. 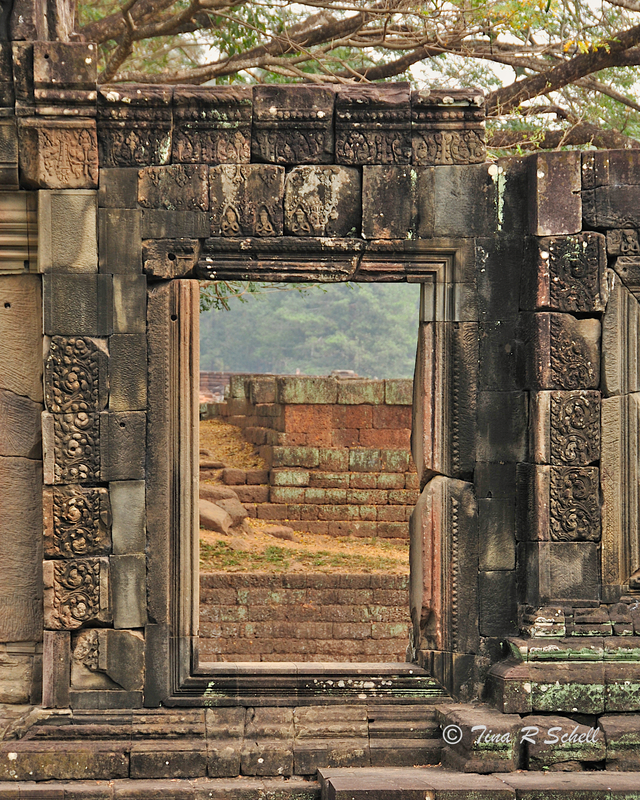 Some of the most interesting aspects of exploring them are the many windows, doors and corridors throughout. 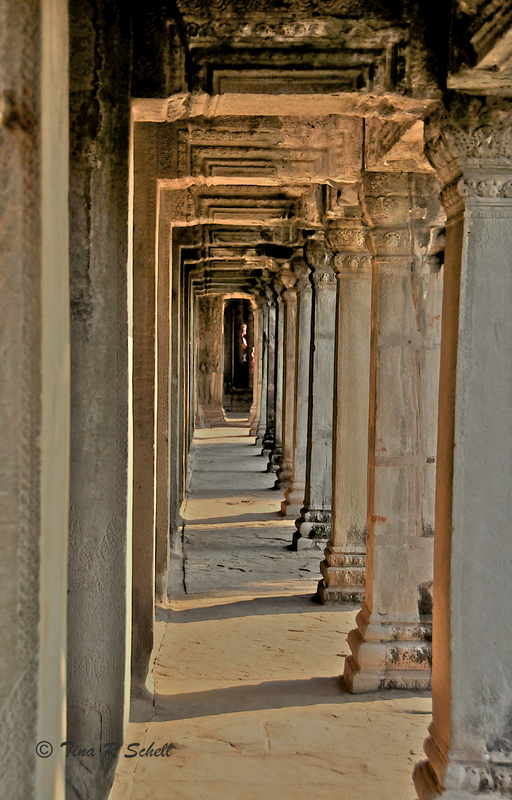 Another interesting element of the complex is the existence of beautiful walls and lines of pillars that once connected various walkways and buildings but which now, for the most part, stand alone. 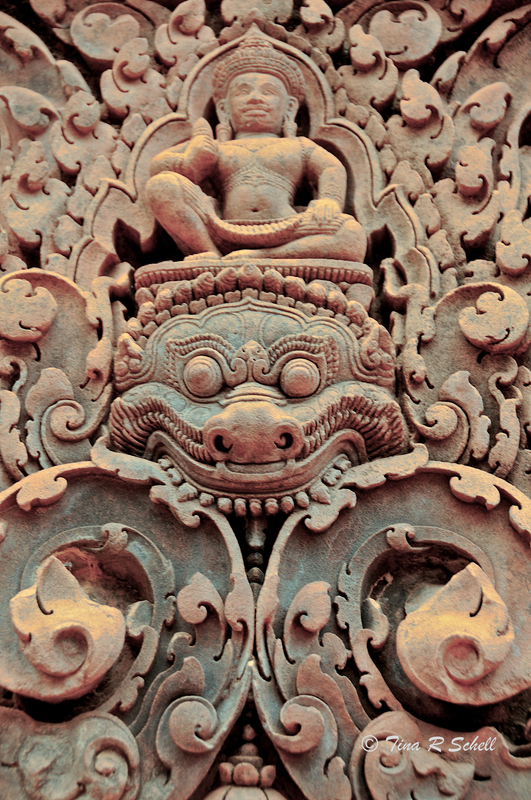 The temples are also famous for their many beautifully intricate bas-relief carvings of Hindu mythology as well as depictions of various wars and other elements of life in centuries past. 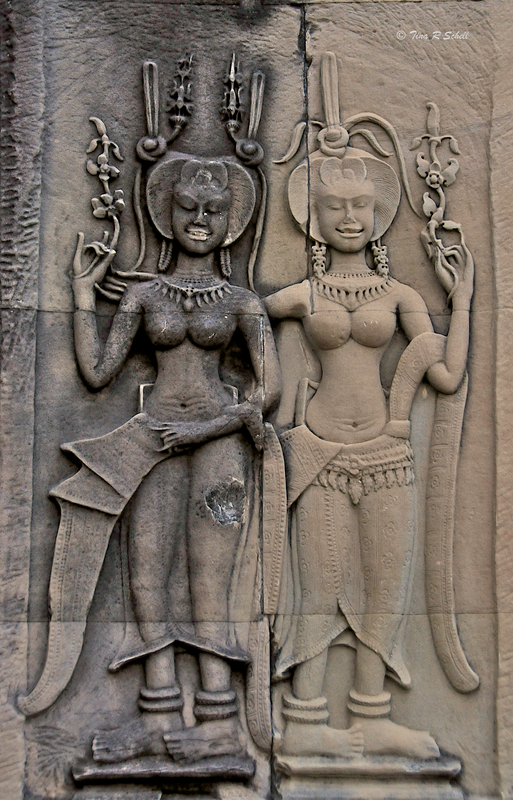 Angkor Wat itself is home to 2,000 apsara (Hindu nymphs) carvings. Finally, a few examples of some of my favorite elements of the temples, each exhibiting the remarkable craftsmanship of the many workers whose talent combined to create a masterpiece of imagination and engineering. With apologies for a much longer post than is my norm, an interesting update. In June of 2013, newly-developed laser scanning technology revealed a huge cityscape far larger and more complex than archaeologists previously believed. 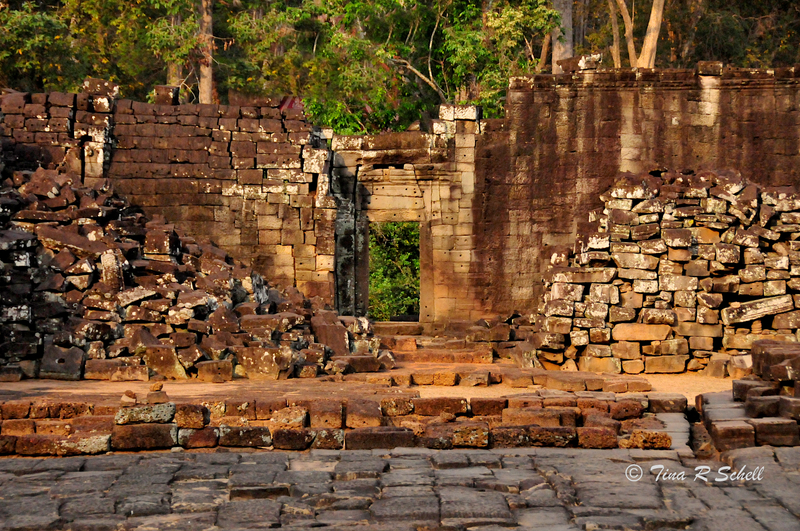 Current thinking is that decades of monstrous monsoons and massive droughts created issues with Angkor’s vast waterways which eventually brought about the destruction of the city. So what do you think? Centuries from now, what will archaeologists find of interest from today’s masterpieces? What will cause them to be lost to future generations until they are found again? Will we be under water like the lost city of Atlantis, destroyed by massive natural events like Pompeii, or like the Khmer rulers, fall victim to our own efforts to sustain our environment? 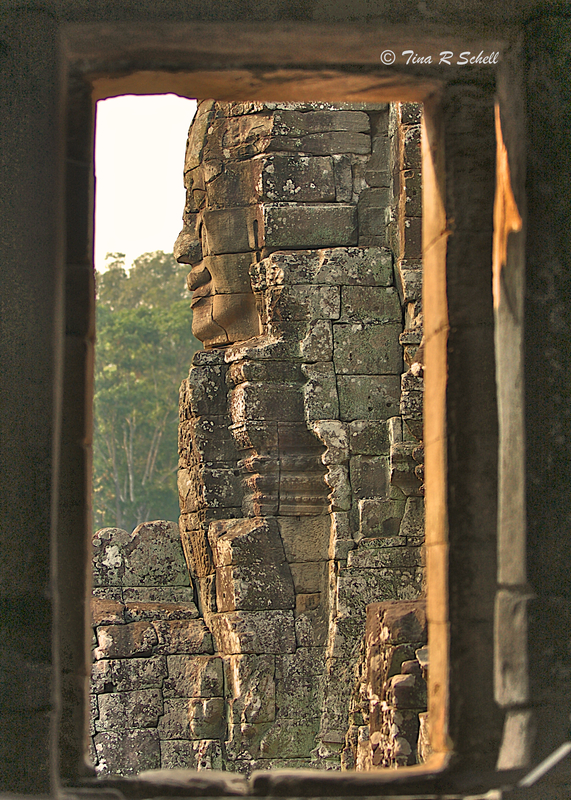 Nothing lasts forever, so whatever is to happen, let us hope our legacy is as glorious as that of the Temples of Angkor. To see more “Masterpiece” posts, click here. funny, we’ve seem to have similar interest in life and traveled to the same place! 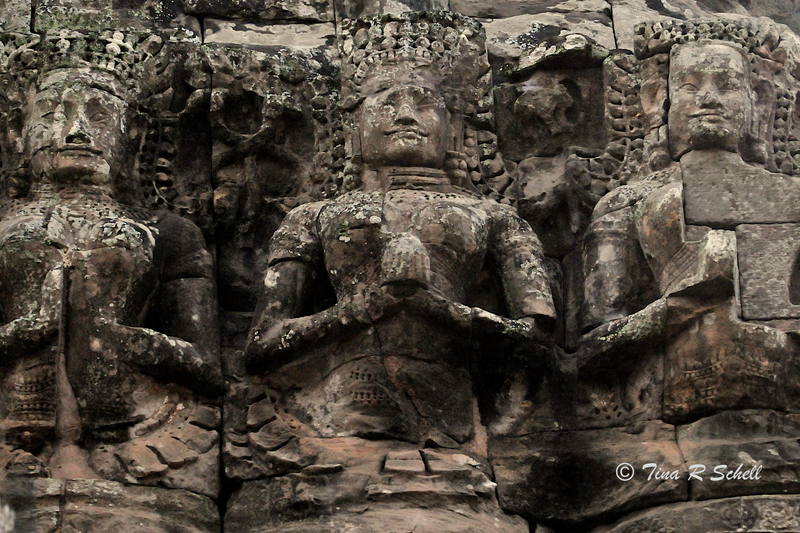 Angkor wat is just beautiful. Also very nice people how live there in the slums. This really is a wonderful photo-essay. No wonder it’s among your top Posts and Pages. Thanks Andrew – high on my list of favorite places ever. Appreciate your stopping by! Thanks so much for your visit and comment. It’s a marvelous experience! Beautiful shots. 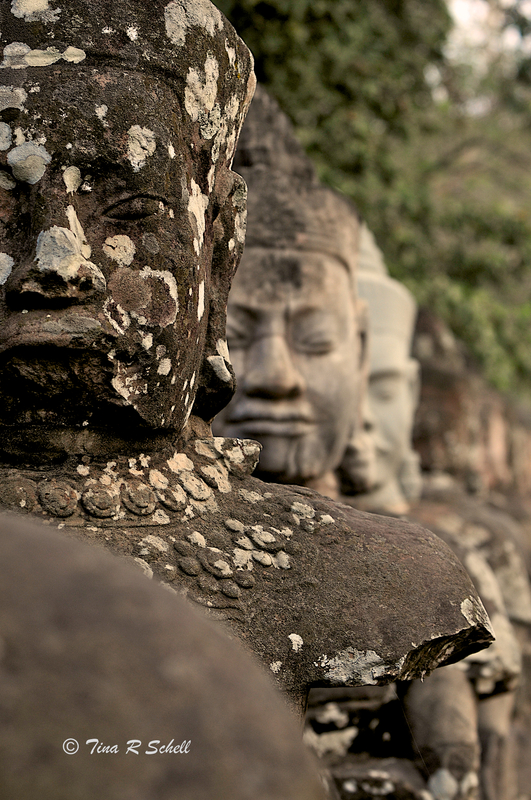 I have heard so much of Angkor and its on my bucket list. Thanks! It’s a definite must–see!! Your pictures really tell a different more interesting story. NOW I want to visit too. These are beautiful, moving shots. I also love your narrative and your use of quotations. Great post; thanks. Thanks so much Su – it was a magnificent journey, enhanced by the amazing photography available at every turn! 🙂 thank you for sharing your journey. I’ve got “itchy feet” now! 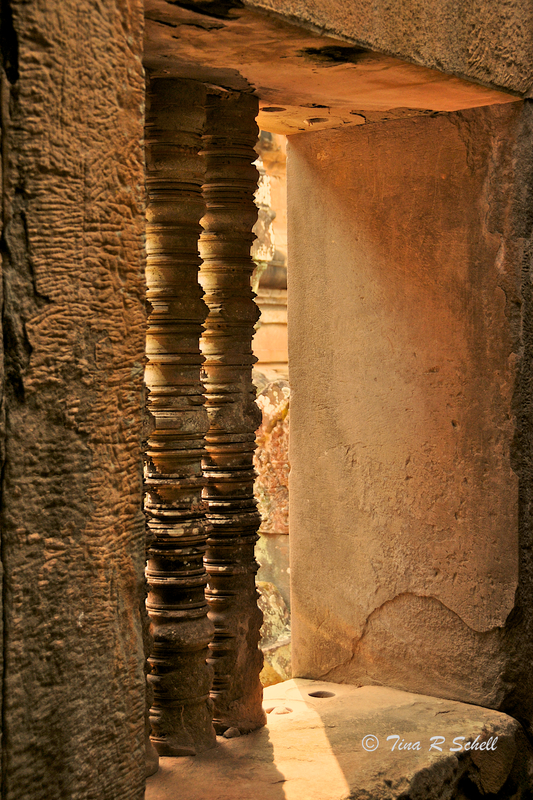 Really beautiful documentary of exceptional site… the photo titled natural light especially grabbed my attention.